Dr. Mita Parikh graduated from the University of Pennsylvania School of Dental Medicine, where she obtained her Doctorate of Dental Medicine. She completed her general practice residency here in the Bronx at the Montefiore Medical Center. 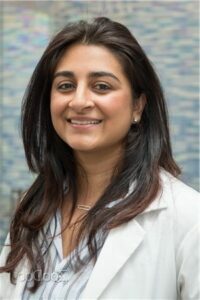 Dr. Parikh followed her general practice residency with the completion of a two year postgraduate orthodontics program at the New York University College of Dentistry. She has extensive experience in orthodontics and the treatments she offers include metal braces, ceramic braces, and Invisalign® clear teeth aligners to help patients attain the beautiful smiles they deserve. In her spare time, Dr. Mita Parikh enjoys exercising and spending quality time with her family and friends. An orthodontist is trained in a special branch of dentistry dedicated to correcting misalignments of the teeth and jaw. Orthodontists work to address a wide range of irregularities in the arrangement of your oral structures, from malocclusion (a poor bite) and overcrowding to aesthetic facial changes caused by bad jaw alignment. With extensive knowledge on the developing neuromuscular and skeletal facial anatomy, orthodontists are highly experienced in the detection, interception, and amelioration of biting issues. In conjunction with resolving the functional concerns caused by a poorly-aligned jaw—including speech problems, difficulty chewing, facial asymmetry, and TMJ Disorder symptoms—orthodontists also strive to create a beautiful, even smile for patients in the least obstructive way possible. This often involves employing cutting-edge orthodontic systems, such as Invisalign® and cosmetic braces, to straighten teeth for discreet, effective treatment. Your child should be screened for orthodontic treatment by the age of seven, which is typically when most children have begun to develop some permanent teeth. Early detection and evaluation of teeth and jaw misalignment can allow your orthodontist to detect any existing or developing biting issues and begin prompt treatment planning before such complications are exacerbated. After this comprehensive examination, your orthodontist can assess whether preliminary orthodontic appliances for your child are necessary, as well as determine the best time to start treatment in the event that intervention is required. In most cases, this can decrease the risk of more complex problems arising in the future and, if appropriate, minimize the amount of time your child has to wear braces. Research their educational background. Ensure your prospective orthodontist has undergone the post-graduate training required of orthodontic specialists. While many general dentists offer orthodontic procedures, those who have studied under curriculum that is exclusively dedicated to malpositioning of the teeth and jaw can be more capable of developing a comprehensive treatment plan for your needs. Learn about their credentials. What are your prospective orthodontist’s professional affiliations? Membership to local, regional, and national organizations like the American Dental Association or the New York State Dental Association can speak volumes about how active and engaged he or she is within their profession. Find out if they pursue continuing education. Newer and more effective ways to address malocclusion are discovered consistently, making it essential for orthodontists to stay up-to-date with the latest technology. Engagement in ongoing education courses typically conveys an orthodontist’s commitment to providing the most comfortable and timely treatment possible. Schedule a consultation. After conducting the necessary research, schedule a consultation with a prospective dentist to ultimately determine whether you feel confident in their ability to achieve your treatment goals. During this meeting, you should feel comfortable and assured that your concerns are being thoroughly addressed. Ask questions. Ensure your orthodontist takes the time to keep you well-informed. Questions you can ask that may give you a better understanding of your potential treatment process include: What will my treatment entail? What distinguishes a given orthodontic system from others? Can you give me an idea of my treatment timeline? Keep location in mind. Orthodontic treatment can be a long-term commitment, usually involving multiple appointments on a routine basis. Choose a practice whose location is convenient for you, and then make sure your prospective orthodontist plans on staying at that particular location for the duration of your treatment. If you would like more information on our orthodontic options, or if you would like to schedule a consultation with Dr. Parikh, please contact our practice today.